Grammy Award-Winning Latin Jazz Flutist Dave Valentin Dies At 64 : The Two-Way Valentin became one of the pre-eminent flutists in Latin jazz, known for his creative combination of fusion, pop and R&B. Valentin died Wednesday of complications from a stroke, his manager said. 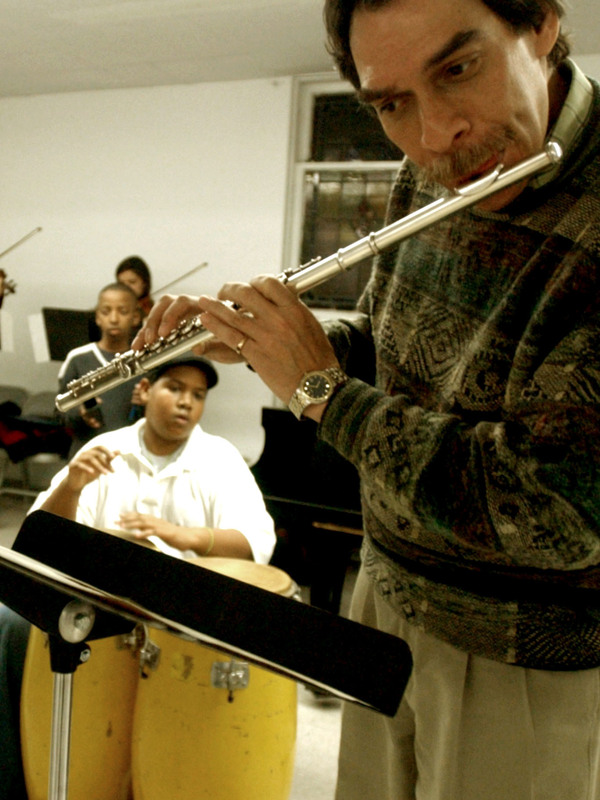 Flutist Dave Valentin rehearses with the children of Opus 118 Harlem Center for Strings in New York in 2003. Valentin died on Wednesday of complications from a stroke and Parkinson's disease. Dave Valentin became one of the pre-eminent flutists in Latin jazz. He was known for his creative combination of fusion, pop and R&B. He won a Grammy in 2003 for best Latin jazz album for "The Gathering," by the Caribbean Jazz Project. Vibraphonist Dave Samuels was also featured on that record. Manager Richie Bonilla told news agencies that Valentin, 64, who had suffered multiple strokes over the last several years, died Wednesday from stroke complications and Parkinson's disease. When he was five years old, Valentin started playing bongos and congas. His father, who was in the Merchant Marine, had brought them home from Brazil. Valentin took piano lessons at 9 and was playing percussion for paying gigs when he was 10. He recorded more than a dozen albums — either as a solo artist, band leader or playing on other artists' recordings. Valentin toured with his childhood idol, percussionist Tito Puente, and was music director of Puente's Golden Latin Jazz All-Stars.
" 'I started out as a percussionist in school. But I wanted to meet this girl, Irene, who was a flutist,' he recalled in 2011.
" 'She showed me a scale, and I played it immediately. Do-re-me-fa-so-la-ti-do. Without knowing nothing! So, I borrowed a flute, bought a Herbie Mann record and learned "Comin' Home Baby." " 'Three weeks later, I went to her and played it,' he continued. 'I knew I had her! She said, "I've been taking lessons for three years and you come in here in three weeks and play like that? Don't ever talk to me again!" " 'I lost the girl, but kept the flute.' "